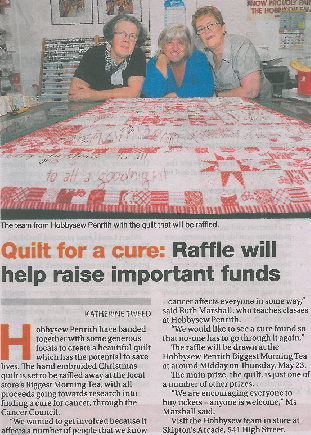 A wonderful quilt, which was photographed by the Western Weekender publication, http://issuu.com/weekenderpenrith/docs/wwmay3?mode=window is being raffled in support of Hobbysew Penrith’s ‘cure for cancer’ fundraising this year. Made completely in red and white patchwork and stitchery, this quilt is a delight and we hope it will raise pots of money for research. To purchase raffle tickets, ph 4731 3061. Don’t just imagine, book your FREE Test Drive! Thinking about a new embroidery machine or looking to upgrade? Or do you just want to see what the Janome MC12000 can do? Isabella, the Janome Sales Educator will be visiting our Hobbysew Penrith, Figtree, Top Ryde City, and Kings Park stores to help and teach you about the magnificent MC12000 machine and help you along with your FREE Test Drive! Bookings are essential as places are limited so contact your Hobbysew today! 18th, 19th & 20th October in Skipton Arcade, High Street – They are celebrating the store birthday with a 40% off End of Bolt sale – WOW! Take the fabric left on the bolt and the price is 40% off the ticketed price. Now that’s a celebration. ﻿Have you thought of getting your sewing machine serviced? To go on working optimally your machine needs to be serviced occasionally. Lucky Hobbysew customers at Hornsby, Erina and Penrith stores can take their machines to be looked after by one of the best sewing machines repairers in the Sydney region, Mario Azzopardi. Recently Mario did a fantastic job in servicing, free of charge, 20 sewing machines for Sewaid. It is so important when sending second-hand sewing machines overseas, that they are in 100% working order before shipment. Unfortunately, when donated goods are sent to third world countries in a non working condition they are thrown out, and the cost of shipping and administration is then wasted. No waste is incurred by Sewaid when we have the services of wonderful people like Mario Azzopardi, who freely give their time and expertise to help people whose lives are not as enriched as our own. So why not book a time to have your machine serviced or repaired by a person with some 25 years experience. Mario will take good care to ensure that you and your machine will go on to enjoy many trouble-free sewing hours together.